Arsenal striker Dennis Bergkamp has signed a new one-year contract, extending his stay at the club until the end of next season. 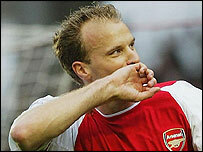 Bergkamp, who turns 35 on Monday, told the club's website: "I am so pleased I will be at Arsenal for another year. "Next season will be my 10th with the club, that just shows what Arsenal means to me and I hope I will be part of another successful campaign." Manager Arsene Wenger said: "We are delighted Dennis is staying with us." Wenger added: "He has once again showed throughout this year what an important part of our squad he is. "Dennis is a great professional and I know his experience and natural ability will continue to help us greatly next season." Bergkamp signed for Arsenal in 1995 from Inter Milan for £7.5m. He has scored over 100 goals for the club and was a key performer in the double-winning side of 1997-98. And Bergkamp has enjoyed a resurgence of form this year as Arsenal won the Premiership title.